Our most popular item, the Nomad platform bed frame is made of smooth, clean, unfinished poplar hardwood by an American based company. Craftsmanship and long lasting quality are part of every KD Frames product. 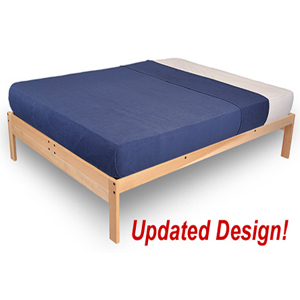 This sturdy design features four rails running the length of the bed(2 on twin)and horizontal support slats. With easy to assemble decks, and slats that lock into place, this is a solid, rattle free bed frame. This unfinished hardwood bed is planed on 4 sides to provide a smooth surface with clean rounded edges. It can be left in its natural state or finished by you in the stain of your choice. Simple assembly is required. Easy to follow instructions are included. This bed fits a standard size mattress and no box spring is needed. Made in the USA. For Our Stain Finished Version Please Scroll To The Bottom Of the Page and See the Montana Bed. This item usually leaves the warehouse in 1-2 business days. The transit time once shipped is approximately 2-5 business days. Distance from Floor to Side Rail: 12 In. Distance Between Slats: 4.5 In. Warranty: 5 year limited manufacturer warranty. The Charleston is an optional headboard for the Nomad Bed. It can be bolted over one end of the Nomad or it can replace it completely. Queen Size 61 In. (W) x 32 In. (H), Full Size 55 In. (W) x 32 In. (H), Twin Size 40 In. (W) x 32 In.(H). To make the space between the slats only 2.8 In. Adding more slats. Our memory foam is pure meaning it has no fillers or toxic additives and uses the highest quality chemicals. Through patented Multiphase Glass Transition Range technology, Cradlesoft® foam also draws heat away from the body for a cool sensation during sleep. Our memory foam is virtually odor free because of our Fresh Foam Technology. Our memory foam is environmentally friendly because of our C02 blowing agent used in the manufacturing process and because our foam contains soy based polyols. § 8 inch total mattress thickness. § 6 inch 2.8 Density Airlay Fibre Foam core. § Multiple layers of pure cotton batting. § Durable 6.5 oz. cotton casing. § Tufted to keep it is shape. § Made with pride in the USA. § Securely vacuum packed & boxed before shipping. § Meets California code 603 fire safety requirements. * thickness is measured before vacuum packaging, please allow 5-7 days after unpacking for expansion.